If you’re just getting started with quilting, you’re probably looking for a step-by-step, basic and thorough book to guide you through the beginning stages of this craft. Author Harriet Hargrave is just the right woman for the job. Her book Quilter’s Academy Volume 1—Freshman Year is designed to be a skill building course in the very basics of quilting from setting up your quilting space to finishing your very first project. But is this book basic enough for even the most inexperienced beginners? Learn more about this best-selling sewing book in our detailed review below. Before we get into our detailed review, let’s take a moment to talk about the author: Harriet Hargrave. Harriet started quilting over 40 years ago with her mother. Her career in quilting began with the production of baby quilts, and she also taught adult education classes. In 1981, she opened up a quilt shop. Since then, she’s gone on to write several books teaching people how to improve their quilting skills. Harriet has been working with her daughter to create the Quilter’s Academy series of books. This book is the first volume in the series and includes nine classes designed to help you build our quilting skills. Let’s take a closer look at what you can expect to learn from this book. Serving as the starting point in this series, this book is designed to be used as a workbook, and contains a series of lessons, classes, exercises and projects. Each section is designed to build your skills and is placed in order of complexity for added convenience. The great thing about this book is that each new project presents new challenges and requires you to master new techniques that will help you continue building your quilting skills. In total, there are nine skill building classes in this book starting with the basics: going over your quilting or sewing machine, rulers and rotary cutters. Volume 1 contains 13 classic quilt projects designed especially for beginners. Each project is presented in a clear, concise way and ordered by complexity. All of the designs included in the book are classic and timeless. You can choose to use traditional fabrics, or trendy colors and fabrics – it’s up to you. All of the quilting projects included in this book give you an opportunity to explore your style and color preferences. While all of the projects in this book are designed for skill building, they are very useful as well. These are quilts that you will be using – not hiding away. As the first volume in the Quilter’s Academy series, this book was designed to help you master the basics of quilting. Volume 1 and Volume 2 focus on quilts made of squares and strips to help you master these foundational techniques. These skills will be the starting point that will help you master high-quality piecing in the future. Each class in this book is accompanied by brilliant color photos and helpful tip boxes and provide you with great advice on techniques that work and why they work. These helpful tip boxes provide you with additional techniques that you can try on your own to see which methods work best for you. It was difficult to find anything wrong with this book. It’s ideal for beginners and formatted in the same way a traditional class would be, which makes it easy to learn. The only complaint defined – and it’s a small one – is that the Kindle versions is not convenient. Because of the nature of quilting – and crafting in general – it’s much easier to work with a physical, softcover book. 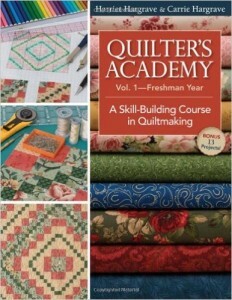 I highly recommend the Quilter’s Academy Vol. 1 by Harriet Hargrave for anyone who is just getting started with quilting. Even if you already have some experience, you’re sure to learn some new tips, tricks and techniques through this book. This truly is an invaluable resource for all quilters. I have to say that I had a wonderful time completing each project on my Janome New Home 7700 and everything turned out amazing. You can also try the Juki HZL F600 for other quilting needs.